It’s the last day of February and it’s time for Thread Theory’s third quarterly report! It’s currently the first quarter of our second fiscal year but I’m labelling our blog quarterly reports numerically rather than cycling from fiscal year to fiscal year. Anniversary: On December 15th we celebrated the first anniversary of Thread Theory as an incorporation. We held an “Anniversary Sale” so that you could all join in on the celebration as well and were thrilled that it was a huge success! Tissue Pattern Release: January 10th saw the culmination of a LOT of hard work – our tissue sewing patterns were officially released both in our store and in stockist stores. 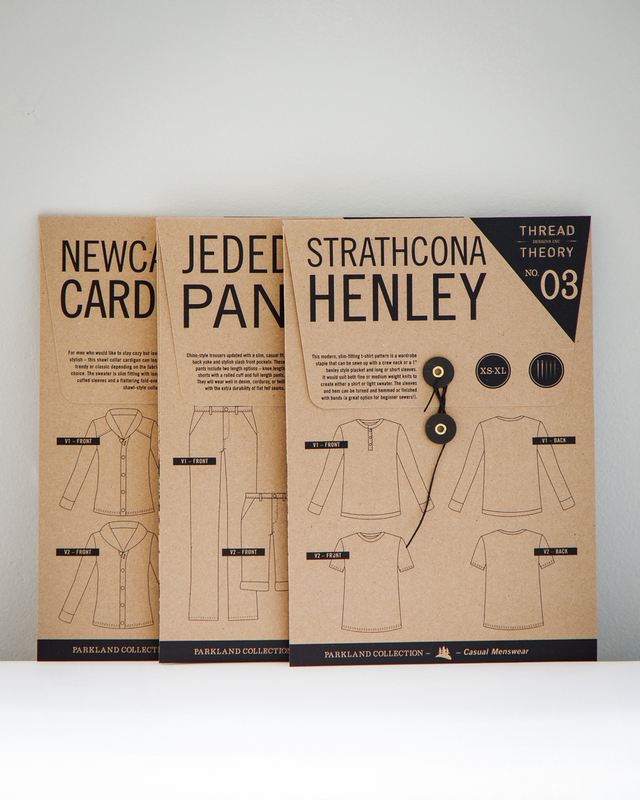 These tissue patterns included the Newcastle Cardigan, the Jedediah Pants and the Strathcona Henley. We had been completely in love with our packaging for quite some time and so it was great to finally show it to the sewing world and hear that you love it too. We have heard nothing but good things about the aesthetic of the tissue patterns so far and hope that our graphic designer, Sonia Bishop, reads this because this success is all due to her! Stockists: A large hurdle that we stumbled on but have since happily climbed over consisted of gathering stockists to carry our tissue patterns. Our system was a little clunky and awkward at first because we were overly eager and sent out a pre-sale notice to stockists before we actually had our pattern envelopes in our hands. Of course, we were bombarded with questions such as “How much is shipping?” and “Can you send photos of your product?”. We couldn’t answer any of these questions without our complete set of packaging which was delayed due to an error in printing. Some of you may remember that one of our goals in the second quarter was to no longer make public announcements and promises until we had all elements under our control. That goal stemmed from this delay and we are proud that we have met this goal ever since! Despite our confusing start to contacting stockists, we are very pleased to have our patterns currently carried by 20 retailers with 7 more retailers either waiting for their package to arrive in the mail or taking the last steps to finalizing their order. 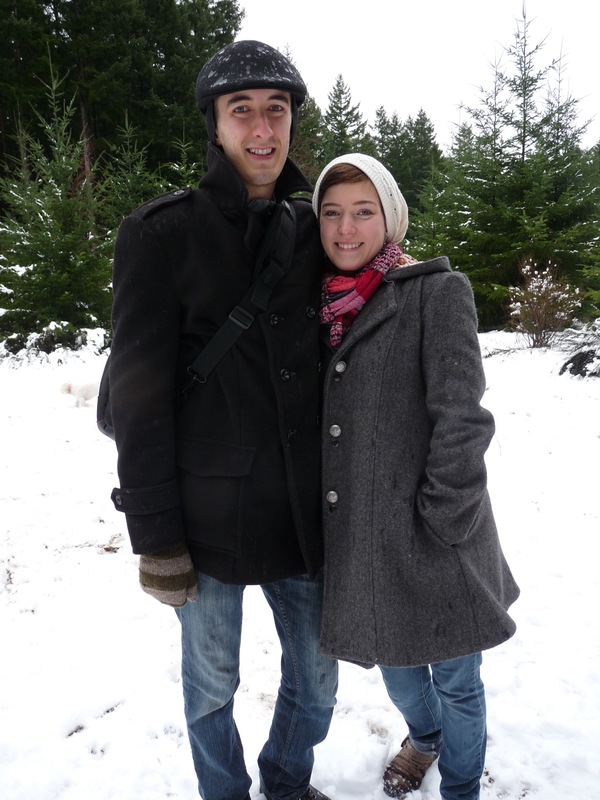 Goldstream Peacoat: The highly anticipated Goldstream Peacoat was weighing us down last quarter. It was a lofty goal to include such a complicated pattern in our first collection but I couldn’t be more proud of how it turned out. We launched the PDF version of this pattern on January 17th and the tissue version of the pattern will be available on March 10th. 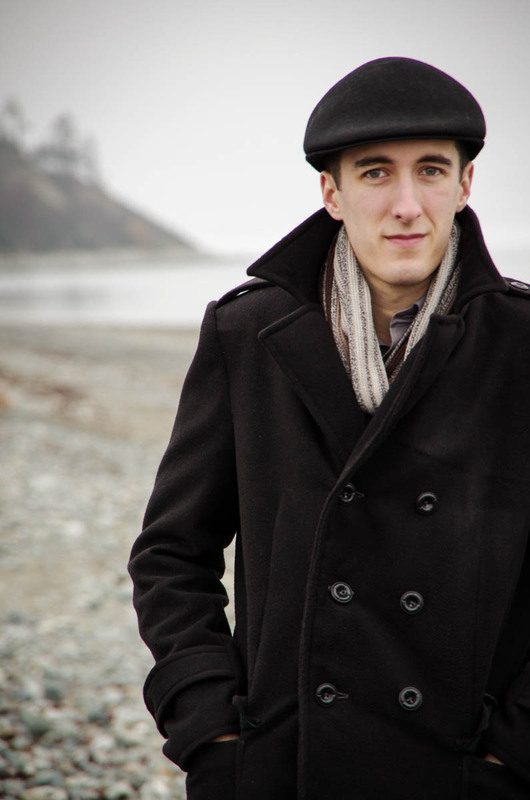 My goal with the Goldstream Peacoat was to create a design that allows sewers to create a very classic looking outerwear garment with the simplest techniques possible. I think that the seam lines and sewing instructions make this possible and hope that the peacoat will help intermediate sewers easily conquer their fear of sewing a coat! My mom finished sewing her version of the coat for my dad very recently and was shocked by how quickly and painlessly the sewing process went. She is an intermediate sewer who hasn’t done much in the way of garment sewing for a number of years (but she sews just about everything for her sailboat) so was a little nervous about sewing a wool coat. She plans to write a guest blog post to tell you about her first big outerwear project and I will be sure to include lots of photos of the amazing results! New Patterns: We also have three new secret patterns currently in development. We plan to release all future sewing patterns in both their PDF and Tissue Variations simultaneously now that we have our system better worked out. The next pattern will have a launch day of March 17th and it is currently in the mail to stockists. It is the very first pattern to be part of our Alpine Collection which will consist of “Adventure Menswear”: clothing that is designed to be rugged and allow for lots of movement during physical activity. The other two patterns don’t have release dates scheduled yet but we will keep chugging away at the process and we look forward to showing you the designs. U.S. Road Trip: In late January we received an email inviting us to appear on Sew It All T.V. (PBS)! In order to film this episode we will have to head to Golden, Colorado so we have decided to do so via land rather than air so that we have a chance to meet some of our stockists. I posted about the trip here but since then we have arranged a trunk show with Fancy Tiger Crafts in Denver the on April 22nd. We are really looking forward to meeting anyone who can make it out for the evening! Magazine Features: Both Sew It All magazine and Sewing World magazines kindly published little features of our company in recent issues. Check them out! We’re hoping my aunt can bring over the Sewing World issue from England when she visits next month, it would be great to see it in person :). New Website: Most recently, Matt spent hours and hours (and days and days) at his computer building us a new website. When we launched our tissue patterns we quickly realized that our current store simply would not work for us any longer – there was no way to have the PDF and Tissue versions of each pattern under the same product without accidentally charging shipping for PDFS…yikes! We love our new store and look forward to making better use of the banner feature (wait until you see the photo we will be putting up on it on March 17th!). We also made Pinterest boards to attach to each product so that you can see as many versions as I can pin all at once for sewing inspiration. Continue to be patient and announce developments and make promises only when all elements are under our control. Things take longer this way but the process is also a lot less stressful for us! Nothing makes me worry and stress more than owing someone something that we promised. Make the VERY MOST of our road trip to Colorado. I really look forward to using the connections we have developed online through this blog and our business to develop real life friends at our different stop off points on our way south. I don’t want my shyness to inhibit making new sewing friends and I don’t want our busy schedules to stop us from making plans to meet bloggers, stockists and any other sewing destinations I discover between now and mid-April. If you’d like to meet with us, comment or shoot us an email (info@threadtheory.ca) and I would be thrilled to arrange something! My personal goal in these next three months is to take the initiative to learn more of ‘Matt’s side’ of the business. I have been working hard in the last couple weeks to become proficient at our daily accounting and my next goal is to learn to smoothly operate our new website dashboard (including some basic coding…eek!). Matt can launch into detailed analysis of dart placements or fabric choices (which often makes me pause in my tracks in shocks…I often expect to be engaging in a sewing monologue only to find I’m having a thorough sewing discussion, when did that happen?!) so I want to be able to do the same when he wants to talk business! I also want to be able to give him a day off once in a while since his involvement in the local fire department is getting to be more time consuming of late (which I have already been doing with our daily accounting and customer service). Lastly, and here’s a big one, I want to ramp up the frequency of tutorials and sew-alongs on this blog. I have been letting this slide for the last two quarters (even though it was one of the goals I made in the last quarterly report…oops) and so have plans for a sew-along for the pattern we will release on March 17th. I also have a pretty exciting idea to increase the frequency of tutorials which I hope to implement in May. Wish me luck! Do you have any goals to suggest for Thread Theory? Are you patiently waiting for another sew-along? Do you secretly hope we make a particular pattern/design our next priority? What information do you really want to know about menswear sewing? We love your feedback, especially any time I write a ‘Behind the Scenes’ style post, and thank you for encouraging us so actively in the growth of our little pattern company! Categories: Friday Posts | Tags: quarterly report | Permalink. Thanks for your update – lots of information. I like the looks of your website and patterns. I want to try the cardigan pattern! Happy sewing 🙂 Be sure to send along a photo when you have a chance to sew the cardigan as I’d love to see it! I’ve loved reading this. Massive congratulations on what you’ve achieved & can’t wait to see what comes next! The paper patterns look amazing. Thanks for sharing the business side of things! I have been freelancing for a few months and am making the jump to start my own business. It’s helpful to have an insider view of another entrepreneur and to be reminded of how important goals are! Yes, goals (and business plans) are everything! Good luck with your business, I am sure you will find it extremely rewarding. As the mother of two teen boys, I haven’t had much opportunity to sew clothing for them in the past several years with the exception of PJ pants (which are worn constantly while at home). I think Louisa’s idea is great…but how about an option with a button placket and hood? My pattern request is cargo shorts! Summer is around the corner and I have to replace their entire wardrobe every summer! Excellent suggestions! My thoughts are that any sweater we release in the near future should have both a collar and hood option for versatility. Thanks for the cargo shorts request. No promises for this summer as all the steps from design to printing always take longer than expected but I think we have something in the works that might fit the bill :). My husband wears this style all winter, indoors and out, and they are quite pricey to buy. Great suggestion! I will most definately keep that one in mind as I know a lot of men who wear similar sweaters all winter as well. They are the perfect mix between stylish and easy-to-wear. Oh and don’t worry about being shy (I’m the same), you seem like a very positive and friendly person, so I think everything will be great. That’s great that adventure menswear sounds promising to you and your man 🙂 We’re starting from the base layer up so by the time our collection is released he could have a full “Alpine Collection” oufit/wardrobe! Thanks for the encouragement! My goal is to do more than just fawn over the gorgeous packaging and beautiful instructions and actually make something with my new paper patterns. Maybe even before I buy the next ones you release! Congratulations on a very busy quarter. Thanks! When you get around to sewing I hope you enjoy the pattern/instructions as much as you enjoy the packaging :). I look forward to seeing what you make!